Stores Reference 22B/470. Approximately 14.5" collar. 48" chest measurement (to comfortably fit 44"). 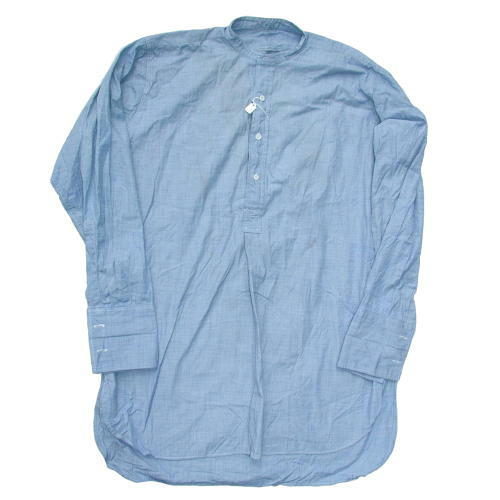 Classic pale blue cotton shirt for use with detachable collars. Double cuffs for use with cuff-links. Early half opening front. There is a small mark on the front (may wash out) and a couple of very small holes in the rear 'tails' area. Wear to the 'fold' of the double cuffs but this isn't too serious in use. A few stitches missing at the upper end of one cuff placket - an easy repair. Generally appears to be in very good overall condition and a generous size. Stock code U22176.